Keyword research is one of the most important tasks to undertake when it comes to internet marketing. In fact, this task is one of the first areas you need to delve into before even deciding on which niche to enter. People all over the world make billions of searches every week, in the hope to find quality information, products or services. Keyword research is about finding a balance. It’s about finding a keyword phrase that enough people search for each month, but with little competition. This is certainly the case if you don’t have lots of time on your hands to wait for results. 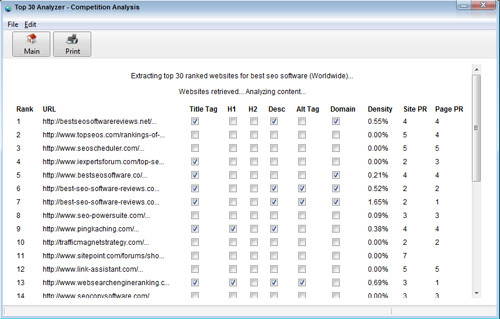 I have developed a cool piece of software called Top 30 Analyzer that allows you to analyze websites for a single keywords, or a list of keywords. This software allows you to visually identify the onpage SEO factors, as well as extract the site PR and page PR for EACH of the top 30 websites. 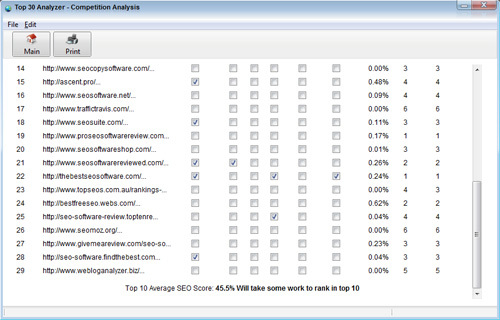 An average SEO score is then calculated using the data from the top 10 websites. 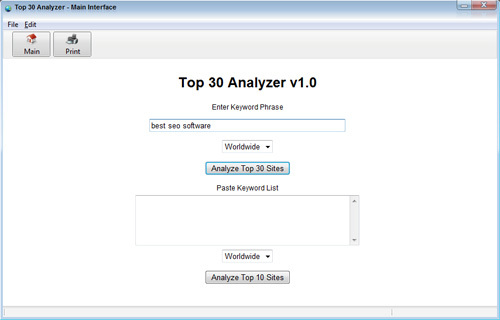 STEP 1: Load the software and enter your keyword phrase into the top text field, and click on the ‘Analyze Top 30 Sites’ button. STEP 2: The software will then retrieve the top 30 ranked websites from Google and will crawl EACH URL and extract onpage elements such as title tag, header tags, meta description, alt tags, domain name, keyword density and also the site PR and page PR. The software will identify if the ‘keyword phrase’ is present within these elements and will highlight this within the results it displays. STEP 3: After the software has completed analyzing ALL the URLs it will calculate an average SEO score at the bottom and give an indication of how hard it would be to rank in the top 10 of Google for that specific keyword. The lower the average SEO score, the easier it will be to rank for that keyword phrase. The ‘higher’ the average SEO score is, the more onpage SEO factors include the ‘keyword’ and the higher the site and page PR is. You can also analyze a long list of keyword phrases in bulk by using the bulk checking feature. I will likely cover this in my next blog post and show yo a good technique to locate and analyze the best keywords. Top 30 Analyzer is available as part of my subscription service. If you haven’t already subscribed you can try out this software along with ALL my other software applications and content network for a FULL 7 days for just $1. Then it is only $17 per month to keep your access.